Have you noticed that one of the first things kids want to learn is how to spell their name? Along with that request they usually want to learn how to read also. Some children will have this desire at the age of 3. Other children may not express this desire until they are 5. A rich language environment is one factor that influences a child’s desire to learn. What does the writing connection have to do with reading? MOM, HOW DO I SPELL MY NAME? When teaching children how to spell their name, they must know the letters in their name and how to form that letter; and third, how to pronounce each sound the letter or the letter combination make. A great way to teach your child's name to them is by using games and puzzles. 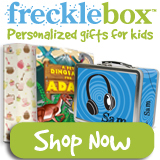 Frecklebox has some wonderful puzzles that are personalized with your child's name. Most children love puzzles, especially floor puzzles. While you are helping your child put the puzzle together, you can be teaching her how to spell her name. Writing is very important to reading as it ties the sounds of the letters to the letter symbols. It is essential that we teach these two things simultaneously. This is especially true for the kinetic learner. Often times children learn the alphabet without learning to write the symbols. Learning the “Alphabet Song” is fine and fun. HOWEVER, this is the time he should also be learning how to spell his name not just singing the song. It is important for the child to be able to recognize the symbol for the letter WITH the name of the letter. This is called the sound-symbol relationship. For instance, when he sees the letter “F” he says /ef/. SO, what's the purpose of writing? The purpose of writing is to be read by others or to be read by you. When we write for ourselves, it is usually notes to remind us of groceries to get, or errands to run. When we write for others, it is usually a letter, an essay or maybe even a book. Many times, children and adults don't like to write because they haven't mastered the process. Even people who have attended college and had to write essay papers may have a fear of writing. Most everyone I know groans when they are asked to write a paper or an essay. My biggest fear is that I will make a grammar error and the person reading the paper won't take me serious. Remember, that we each write from our experiences. Therefore, everyone will have a different writing style; the way they present the information for the reader. Some authors have a very straight forward, traditional way of presenting their information. Others, like Max Lucado, will present their topic in a very unconventional manner. Yes, there are certain grammar rules that should govern our writing but that doesn't mean that it will be boring. If you're not sure if a comma should be used before a but in a sentence, then find out. We learn grammar rules best when we use them with our own writing. Not sure where to get help? Let Writing Savvy be your guide to English grammar and writing. This site offers free grammar lessons, exercises and practice tests. Need assistance in writing an essay? Writing Savvy has tutors to help you for a nominal fee. See sight word activities or vocabulary activities for some games that will help develop this reading/writing connection early. Click the button to read my articles.